^ Maclean, Fitzroy. Pskov: A Journey Into Russia's Past; Pskov: An Old Russian City. The New York Times. 1979-03-18 [2017-11-26] （英语）. 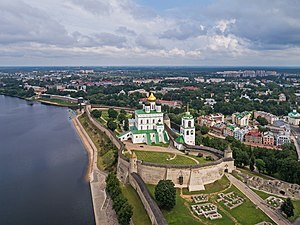 ^ The Pskov Kremlin, one of the strongest medieval fortresses. RIA Novosti. 2010-04-29 [2017-11-26] （英语）. ^ Two towers of Pskov Kremlin almost ruined by fire. RIA Novosti. 2010-04-28 [2017-11-26] （英语）.